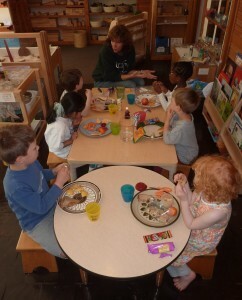 The Children First snack table is stocked with healthy snacks from 8:30 AM until just before lunchtime. 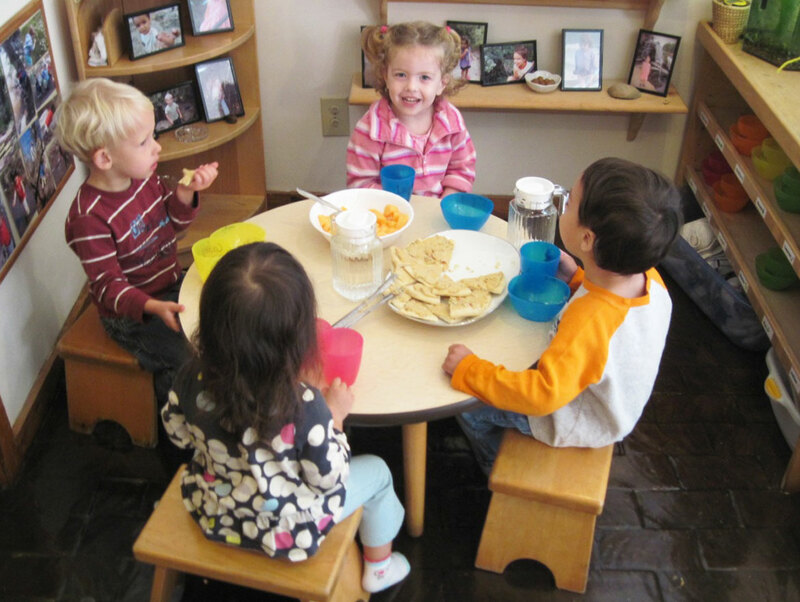 Our snack includes a nut or dairy protein; a fruit or vegetable; and a whole grain cracker, bread or cereal, all foods that meet or exceed the nutritional standards of the federal Child Care Food Program. Generally, we avoid foods high in sugar, salt, saturated fat, and additives. 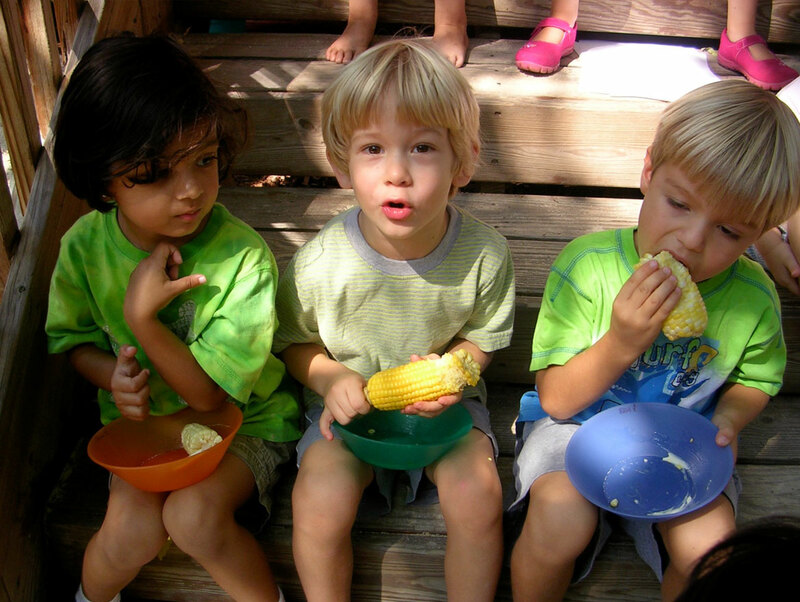 And of course, it’s not just the snack table that is “open” for hungry Children Firsters – there are probably tomatoes or raspberries or onions available in the garden! Our cooking curriculum focuses on developing skills with cooking tools, like making a level measurement and chopping with a real paring knife; on the mathematics and literacy of cooking, like reading picture recipes, measuring and counting; and on working with foods in their original form, like beginning with a pumpkin and ending with pumpkin bread; or beginning with apples and ending up with applesauce, or planting lettuce that we later harvest to make salad. 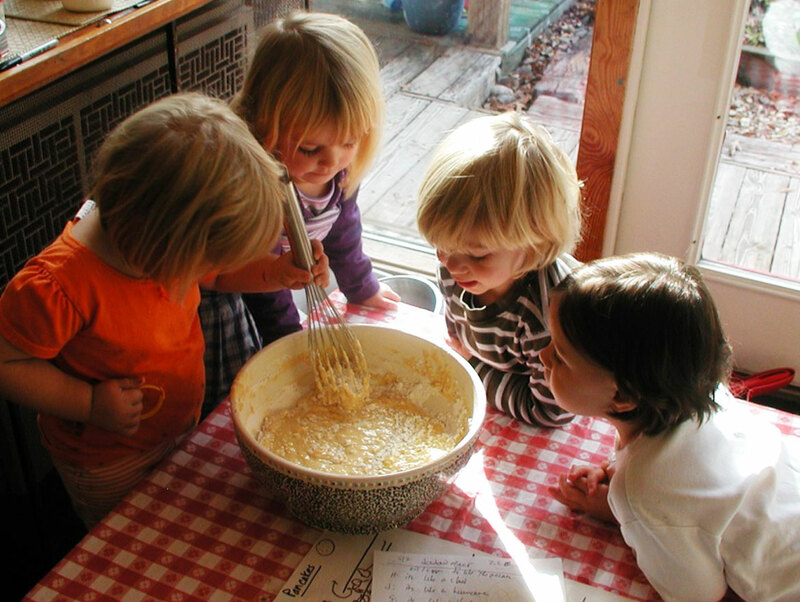 We also encourage families to come in and cook their favorite foods with the kids or to send us beloved family recipes to try. And then there’s the most exciting cooking project of the year – making a big pot of Stone Soup to share with our families at the December Stone Soup Feast. Children bring lunch from home. While they are at meeting with one teacher, the other teacher sets the lunch tables with plates, utensils and cloth napkins, and unpacks children’s lunches onto the plates. We find that making the food and the setting attractive encourages a lunch experience that is more like eating at a restaurant with friends and less like what many adults remember from their childhood experiences in noisy chaotic school cafeterias. 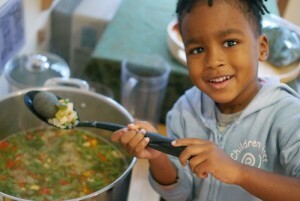 We encourage but never require children to taste a variety of healthy foods. Likewise, we do a lot of talking about good nutrition and balanced diets, but allow children to choose how much and what they will eat. Ultimately, we believe that kids who learn to eat when they are hungry and to choose the foods they are hungry for will make good decisions about nourishing themselves. Yay for us to have some corn!